The Institute for Development and Human Security (IDHS) (Director: Kim Eun Mee) held the “International Girls’ Health Student Writing Competition,” “Policy Forum: Children’s Vulnerability and Humanitarian Support” and “International Conference: Global Health Cooperation of the Sustainable Development Goals (SDGs),” in order to improve health in developing countries and seek ways to fulfill the SDGs, for two days from September 18 (Tuesday) to 19 (Wednesday) at the LG Convention Hall of the International Education Building. This event is the first program in Korean universities which is planned based on results of ongoing studies: Advocacy for Korean Engagement in Global Health Development (2013-2016); and Korea Global Health Strategy (2016-2019). These two studies have been conducted by the IDHS with two research funds from the Bill & Melinda Gates Foundation, the world’s largest charity organization. 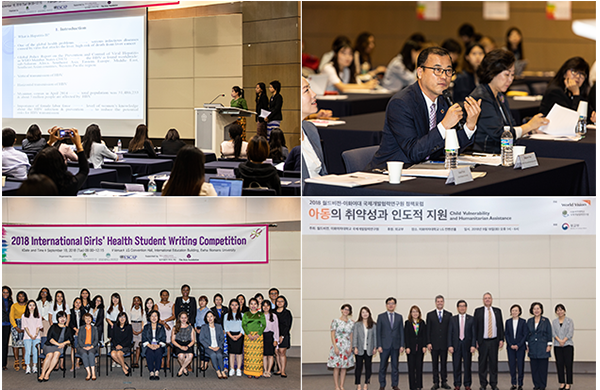 On September 18 (Tuesday), the first day, the “International Girls’ Health Student Writing Competition” began at 9:00 a.m., which was co-hosted by the Ewha Global Health Institute for Girls and the UNESCAP Subregional Office for East and North-East Asia. This conference, with aims to let people know issues related to girls’ health emerging as an important matter in international society through voices of young adults across the world and to encourage leadership of young generation in the fields of international development cooperation and healthcare, was sponsored by various domestic and foreign institutes including the Gates Foundation, the Korea International Cooperation Agency (KOICA), the Asia Foundation and the Korea Association of International Development and Cooperation. At 1:30 p.m. on the same day, the “World Vision-Ewha IDHS Policy Forum” was held with the theme of vulnerability of children in conflict areas and humanitarian support, and the relevant photo exhibition took place simultaneously in front of the Ewha Womans University Museum. 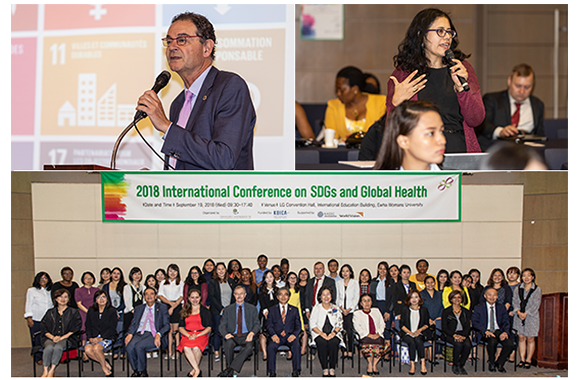 On September 19 (Wednesday), in the “International Conference: Global Health Cooperation of the SDGs” held with the support of the KOICA, an awards ceremony of the student writing competition, the plenary meeting and round table session progressed, and ways to improve effectiveness of health cooperation in developing countries with roles of Korea were discussed.